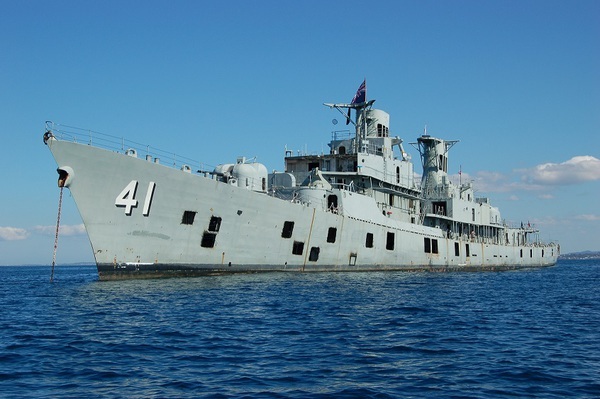 On 31 July 2005 at a site 2.9 nautical miles east of Mudjumba Island off the Sunshine Coast explosives were detonated and in two minutes and ten seconds, the former HMAS Brisbane was on the bottom of ocean in 28metres of water. The wreck now serves as a world-class artificial reef and diving site - she has attracted divers from all over the world. Divers from open water level, to divemaster, instructors, dive shop owners and ex servicemen who served on the HMAS Brisbane all sing the praises of this great wreck dive. Sitting bolt upright the HMAS Brisbane has 15metres of water over her forward decks and 18metres over her stern. Consistently good water clarity and minimal swell makes for great diving. Its sheer size makes it an awesome sight. Water temperatures range from 17C in winter to a summer high of 27C. Visibility averages around 15 metres but up to 20 metres or more is not uncommon. As an Open Water Diver, you are able to explore the upper decks of the Brisbane.